Operate Your Tongue — No thank you! Nur is a 64-year-old Indonesian lady. Her problem started about 4 years ago (2011) when she had a small lesion in the middle of her tongue. She did nothing about it. In 2002, she consulted a doctor who did a biopsy for suspected tongue cancer. The result did not find any malignancy and the doctor diagnosed it as “glossitis kronis dengan sicatrix” (chronic glossitis with cicantrix). Note: Glossitis is an inflammation of the tongue that causes it to swell in size, change into different shades of red, and develop a smooth appearance on the surface. Cicatrix is a scar left by the formation of new connective tissue over a healing sore or wound. The problem became worse and almost the entire tongue was “infected”. In addition, she had purplish patches on her forehead and hands as shown below. In 2015, Nur consulted a doctor in Bandung and was told to operate her tongue. Nur and her family refused and came to seek our help. We told Nur, we were at a loss — we have not seen such a case before. So don’t expect us to cure her. But we can try since Nur did not want to go for medical treatment (note: her daughter is a nurse!). Listen to our conversation over a period of 7 months on the herbs. Patient: It started off as a small lump. I did not do anything about it. It was only after 2 years that the problem became serious and the lesion started to spread out over the tongue. Daughter: There were some lumps under the tongue. We went to the doctor and was told it was a fungal infection. P: I was given medicine to take but it was not effective. Chris: Then the problem dragged on until 2015? D: We went to see a doctor in Bandung and was told to operate the tongue. P: Want to operate but I didn’t want. C: Operation means to cut off the tongue? D: The suggestion was to remove the top layer of the tongue and then do a transplant. We did not want to do that. C: I have not seen such a case like this before. So I don’t know what I can do. I am not sure if it is cancerous or not. I have herbs for the tongue but for your case, I cannot say of the herbs will help you or not. If you want to try — okay. But if after taking the herbs for 2 to 3 months and you do not get better, then you should not take the herbs anymore. D: According to the doctor in Bandung, he said it could be a slow growing cancer based on what he read from the internet of a similar case like this. C: It is indeed an exceptional case — rare. I believe the doctor himself has not come across many cases like this. Daughter No. 2: She is afraid and anxious. C: Don’t be afraid. Let’s be patient. Even if you are afraid, this fear is not going to cure you. P: I can’t sleep at night. Worried. C: If you can’t sleep because you are afraid and worried, this will make you worse. The more you don’t sleep the worse you become. Don’t be afraid. Go home, pray and ask God to help you. C: After taking the herbs, how do you feel? P: I have more strength. I am not tired anymore. Before I was able to work. C: Now, can you work? Before taking the herbs, can you work? C: Let’s compare the day when you first came here and now, 2 months later after taking the herbs — do you feel better? More confident in what you are doing for yourself? P: I am better! More confident. C: Did you feel you get worse? P: Before I was half dead (with action). Now okay. Son: Has high spirit now! C: Ibu, you were on the herbs for 7 months now. Do you feel better? P: Good! I can walk far. Half (of the tongue) is already good, only the other half not yet. Before taking the herbs, almost the whole tongue was infected. C: Wonderful. Any problem now? P: With respect of the tongue, no problem at all. P: Yes. I have more energy. Before I came here I had to go for “infusion” to boost up my energy — once or twice a week for the whole month. After that I came here. C: After the “infusion” you were better? More energy? P: No, still not good. C: After taking the herbs, you have more energy. Herbs are better than infusion? What is the problem with her tongue? Cancer or not cancer? We don’t know. Let the expert decide what label to give to such a problem (see note below). What is important to us (and also the patient) is, Nur is well. Before coming to CA Care she was desperate, lost and full of anxiety. Now, with the herbs, she is better — emotionally and physically. Even her tongue has improved. More healing will come if we learn to cultivate a sense of gratitude in our hearts. Be grateful for what we are each day. With God’s blessing the body gradually heals itself. Note: Two ENT specialists responded to our enquiry — that is this problem? One ENT suggested Differential diagnosis: 1. Oral candidiasis – painful? Usually with older immunocompromised patients. 2. Range from Leukoplakia/ hyper keratosis.This one is more of a pre-malignancy. Another ENT explained: There is a large area of hyperkeratosis of tongue involving the greater part of dorsum and the Right lateral edges. The skin shows purpuric patches extensor surfaces of wrist, forearms knee, and the Left brow. Smaller flat brown macular spots on the limbs can be part of the purpura or café o la spots. Tongue irritation caused by betel nut, tobacco can cause the leukoplakia. Hairy Leukoplakia due to immune deficiency conditions. HIV, immune suppression can cause it. The problem is how to tie the above to a bleeding diathesis manifested on the skin. Leukoplakia is premalignant. Biopsy is needed. From the internet we find the following information. Leukoplakia is a clinical termrather than a definitive diagnosis that refers to a fixed white patch or plaque on the oral mucosa, assuming other causes have been excluded. Leukoplakia is an important risk factor for carcinomas of the oral mucosa and patients should be followed closely. Leukoplakia is relatively common with a prevalence ranging from 0.5 to 1 %. It’s the most common pre-malignant lesion in the mouth. The main concern is transformation to malignancy, which can occur up to 20 years later. Malignant transformation may be recognized by changes in the lesion such as local hardening with nodule formation and/or ulceration. Hyperkeratosis is a layered buildup of keratinized cell tissue and is distinctive for its leaf-like appearance and consists of a horny overgrowth of irregular margins on the vocal folds. 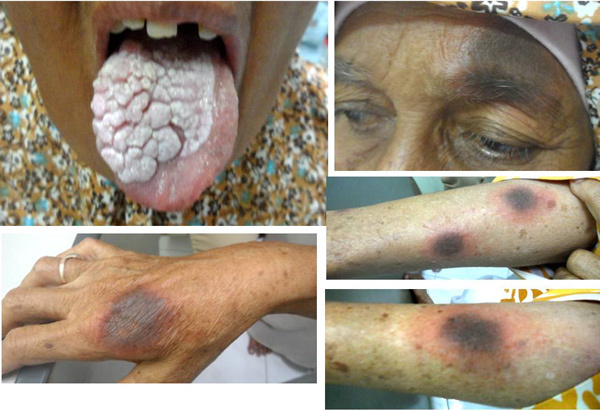 Both of these lesions are treated as cautionary signs for possible future malignancy. Treatments for Leukoplakia and Keratosis: Surgery has been the main approach. Some patients seen who have undergone surgical treatment for the removal of these lesions have experienced a return of the growths.